Add ceiling porch bead board to an existing plywood porch ceiling or install tongue and groove and you've just created a warm inviting porch. 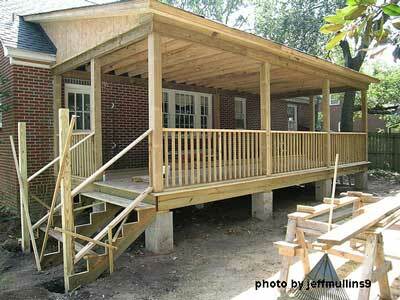 Most porches are either open with visible rafters/joists or covered with various materials. 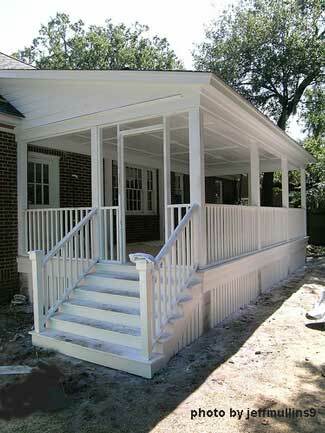 Like other parts of your porch you have options. Mary and I also have ideas for ceilings like porch ceiling lights and more. The ceiling on your porch can be a wow! Plywood: Probably the most typical ceiling covering, plywood can be painted. We recommend a quality exterior grade plywood be used as it is susceptible to moisture and will separate if wet over time. I'd prime the edges as well to keep out moisture. Tips: Plywood installation is quick because you are using a minimum of 4' x 8' sheets. Recommend using larger size sheets if available to minimize the seams. Before doing so remember that plywood is heavy and will require several people to assist in installation. To hide the unsightly seams, consider using decorative strips in a 2' x 2' square pattern. You can paint the strips either a complementary or contrasting color depending on the effect you want. You'll love the results! Bead board: A mainstay for ceilings, bead board panels are easy to install over plywood. Bead board can also be painted or stained and will really add warmth to your porch. 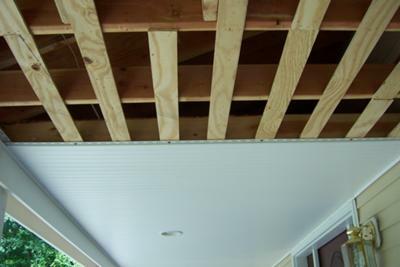 Bead board panels can be applied directly over exposed joists (if the joists run parallel to your home. Tips: When installed leave a 1/4 inch gap around the edges for expansion. Vinyl Bead board: Vinyl bead board is virtually maintenance-free. Shelly from New England submitted some excellent tips about putting up a vinyl bead board ceiling. Her photo is shown above. 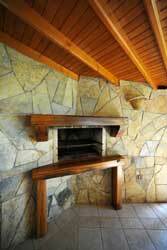 Tongue and Groove: Perhaps the most beautiful of all ceiling materials, tongue and groove comes in a variety of woods, can be custom made to your specifications, and looks fantastic. Tongue and groove boards come in various widths also. Normally, tongue and groove ceilings are stained. Tips: When installing tongue and groove, use stainless steel ring nails. Also, allow for expansion and if using wide boards (4" or more) nail the board to the joist in several places. Also, miter the end cuts so that the boards fit together end-to-end nicely. This prevents separation lines when the wood expands and contracts. PVC: There are several products on the market that do very well such as Azek ® and Variform ®. This solid core, cellular vinyl (PVC) material stands up under the most severe weather conditions and is perfect for that beach or coastal porch. It is very stable to minimize expansion. PVC ceilings come in a variety of colors and usually has reversible edges so you can have either center bead or v-groove designs. 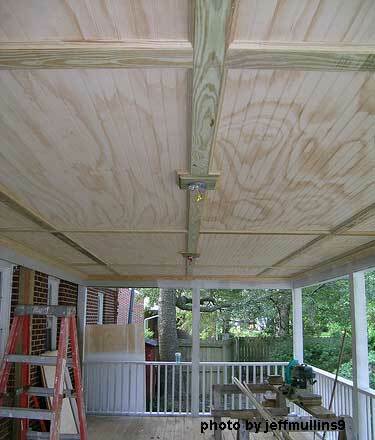 Tips: Install solid sheathing to the underside of the porch ceiling joists if you live in a hot climate. Composite: Need a low maintenance ceiling. Try composite panels such as Try Royal Wood® Tongue-and-Groove panels. They are ideal as they resist moisture absorption, won't rot, and have both v-groove and bead design. Tips: Composite ceilings can be painted but should be scuffed with sandpaper first or apply a coat of primer. 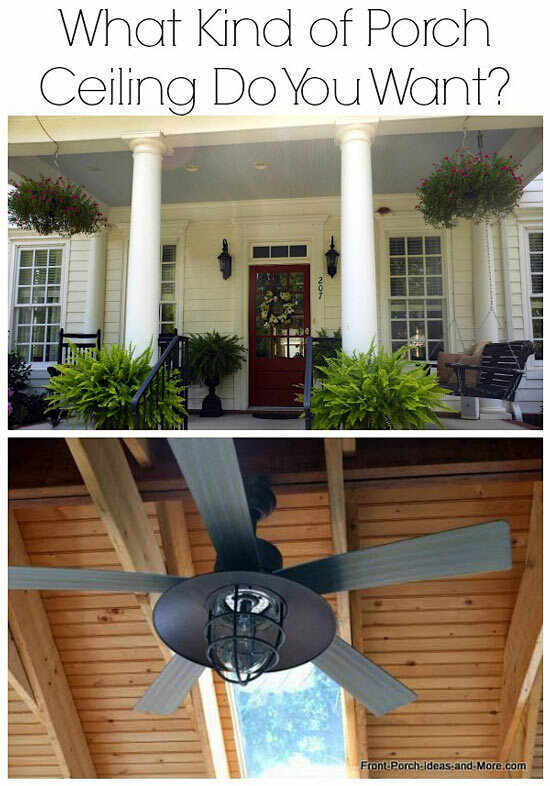 Now that you have the right porch ceiling, add a ceiling fan! Easy to install, an outdoor ceiling fan will add a steady breeze on those hot summer days. They look great and will add both ambiance and comfort for your family and guests. 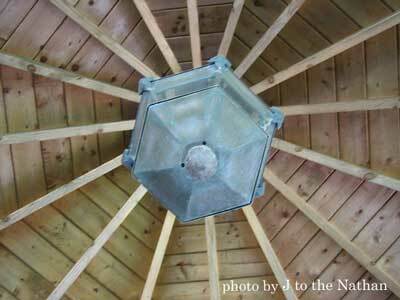 Did you know porch ceilings are traditionally painted blue? Word has it that it reminds people of the sky or that it wards off mosquitoes. Either way, a blue ceiling looks great! 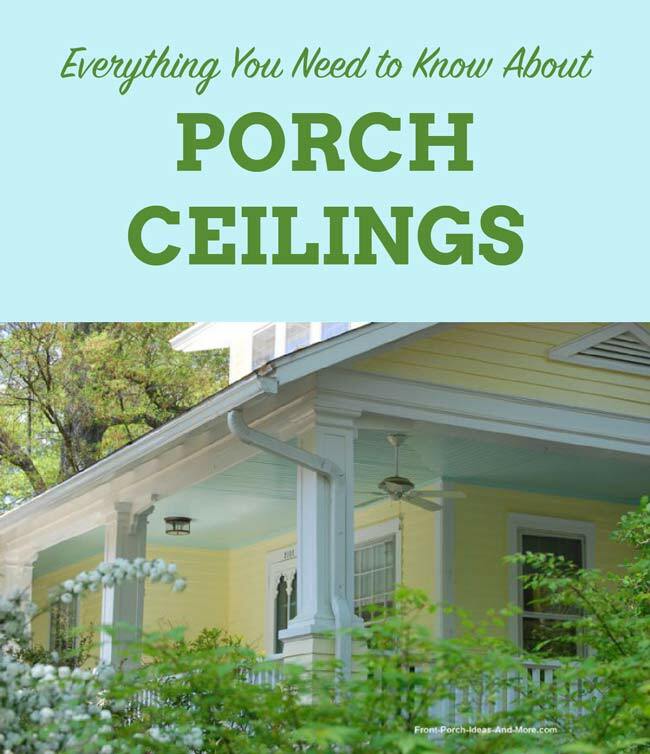 Did you get some insight about ceilings on porches? We hope you did. 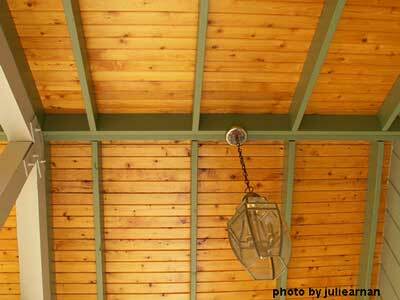 Now take a look at a porch ceiling transformation that our reader Shelly shared with us.